Sanjay Narula enters the core TAAI team as the Vice President. The CEO of Apex Travels & Tours and a member of TAAI’s Northern chapter is absolutely delighted to be back in the Managing Committee. “I am overwhelmed with the confidence and support that the members have shown us. But it also puts a lot of pressure. There are several issues that have come to our notice such as the various taxation issues that have been raised by the recent amendments. But TAAI can work with the tourism industry to find out a middle ground and to seek a certain amount of relief for our members. I hope this will be one of the main points that TAAI MC will focus on,” Narula said. 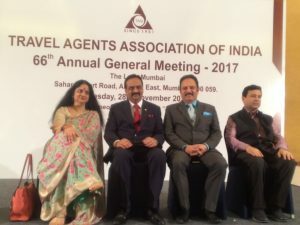 Sunil R. Kumar has been re-elected as the president of Travel Agents Association of India (TAAI) for the term 2017-19. While Sanjay Narula has been named the vice president, Jyoti Mayal will be the honorary Secretary General. Imitiaz Qureshi has been elected to the post of National Treasurer. “I have been elected for the second term and therefore, the responsibility is greater,” Kumar said, adding, “members have expectations, so we need to work towards getting airlines closer to meeting their expectations. It’s a tough challenge, but I believe we are tougher.” The announcement was made during the association’s Annual General Meeting (AGM) on November 28, at The Lalit Mumbai. The seven Members elected to the Managing Committee are: Anoop Kanuga, Gurmeet Singh Vij, Rajan Sehgal, S. Saravanan, Bhagwan Ramnani, Anil Kumar, and Devaki Thiyagarajan. 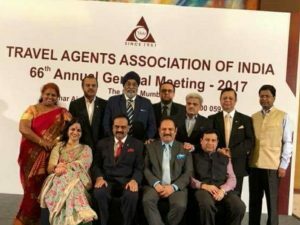 The Travel Agents Association of India (TAAI) has revealed its final nominee list for its upcoming national elections. 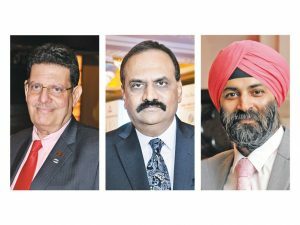 Running for presidency are three members – Harmandeep Singh Anand, Marzban Antia, present Vice President of TAAI, and current national president Sunil Kumar. Two nominees for the Vice President position are Jay Bhatia who is currently serving as TAAI’s Honorary Treasurer and Tourism Council Chairman and Sanjay Narula. Running for the position of Honorary Secretary General are two members: Lokesh Bettaiah, current Secretary General, and Jyoti Mayal, Member of the Managing Committee. Two members have signed up as nominees for the position of Honorary Treasurer. One of them is Shreeram Patel, current Co-Chairman, Airline Council, TAAI, and Imtiaz Qureshi, who is a MC member. The national elections will be held on November 28, 2017 at The Lalit Mumbai.